Because Idyllwild Arts’ innovative and challenging double curriculum of arts and academics produces creative thinkers who can adapt to any college environment (and thrive in any professional environment!). Your lifetime adventure in the arts begins at Idyllwild Arts Academy, one of the most prestigious arts schools in the world and only one of three such institutions in the United States. We encourage you to take the first step in fulfilling your artistic dreams. 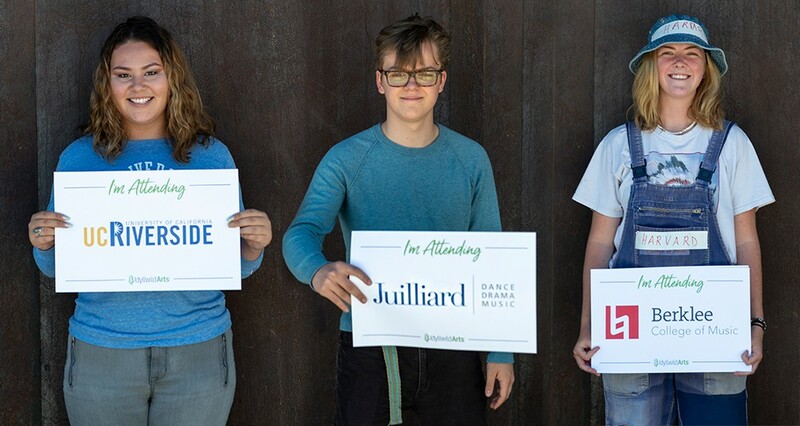 At Idyllwild Arts Academy you’ll join talented young artists from around the world who, just like yourself, are setting off on an exciting journey to pursue serious study in Dance, Film, Music, Theatre, Visual Art, Creative Writing, InterArts and Fashion Design. Here you will find your arts education enhanced by renowned teachers who are working professionals in their respective fields. While your artistic potential blossoms, you will also gain a college preparatory academic education. As a result, Idyllwild Arts Academy students receive a rich and diverse education in both arts and academics. We have helped our graduates continue their arts education at the top universities and conservatories in the world. We welcome you to peruse our website to learn more about our school and the exciting opportunities that await you. Our mission is to bring together talented artists from many different cultural and socio-economic backgrounds and provide a place for them to flourish and grow both artistically and academically. If the arts are your passion, then this is where you belong. As you become more familiar with Idyllwild Arts Academy, we are sure you will begin to see yourself here. We invite you for a campus visit during which you will have the opportunity to meet our staff, get to know our students and faculty, participate in classes, see the campus and audition or interview with our department chairs. Through your personal visit to Idyllwild Arts Academy, you will discover an exciting place to pursue your dreams. We look forward to meeting you! We are delighted that you have taken the first step on your journey to a lifetime in art by applying to Idyllwild Arts. We have streamlined the application process to make it easy and convenient for you. Located at an elevation of over 5,000 feet on the western slopes of Southern California’s San Jacinto Mountains, the village of Idyllwild is renowned for its cultural and arts environment, as well as its stunning natural beauty. Set amid towering alpine forests, majestic mountains, and tranquil meadows, Idyllwild is an historic town that has long had a reputation as an arts mecca. Idyllwild offers a peaceful and remote setting from urban distractions, although it is located just 2 hours by car from Los Angeles or San Diego. Students can take advantage of Idyllwild’s broad choice of recreational activities on campus, or by visiting the nearby town of Idyllwild, with its restaurants, specialty shops, and art galleries. 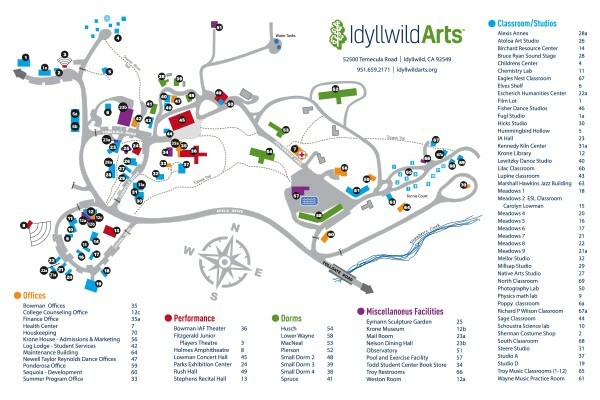 The Idyllwild Arts campus is located only 2 miles from the center of town. (shorter route through Hemet now has limited availability to traffic that will be escorted by pilot cars: Caltrans). Take I-215 to CA-60 E toward Indio, to I-10 (San Bernardino Freeway). Go for 38 miles. Take exit 131 toward Monterey Avenue, which leads directly to Highway 79, to its junction with Highway 243 at Mountain Center. Right onto 243, four miles to Idyllwild. Left on Tollgate Road, one mile to campus. Take I-10 (San Bernardino Freeway) for 113 miles. Take exit 131 toward Monterey Avenue, which leads directly to Highway 79, to its junction with Highway 243 at Mountain Center. Right onto 243, four miles to Idyllwild. Left on Tollgate Road, one mile to campus. Take I-10 (San Bernardino Freeway) for 23 miles to exit toward Corona/South Campus Drive onto CA-71 S (Chino Valley Freeway). Go for 16 miles. Keep left onto Chino Valley Freeway (CA-71) toward CA-91 E/Riverside. Go for 0.5 mile. Take ramp onto CA-91 (Riverside Freeway). Go for four miles. Take exit 51 toward San Diego onto I-15 S (Corona Freeway). Go for 39 miles. Take exit 58 toward CA-79 S/Temecula Parkway and go for 18 miles. Turn left onto Cahuilla Road (CA-371). Go for 21 miles. Turn left onto Pines to Palms Hwy (CA-74). Go for 12 miles. Turn right onto US Highway 243 (CA-243) and go four miles to Idyllwild. Left on Tollgate Road and go one mile to campus. Highway 15 north to Temecula. Exit Highway 79 south toward Indio/Palm Desert. Highway 371 Turn (or bear) left onto (Continue towards Indio/Palm Desert). Left at Highway 74, 10 mile to Highway 243. Right four miles to Idyllwild. Left at Tollgate Road. One mile to campus. There is no public transportation to or within Idyllwild. Transportation is available via campus vans from Ontario International Airport or Palm Springs Regional Airport and Idyllwild. Arrangements must be made in advance. Idyllwild has earned the distinction of becoming one of the 100 Best Small Art Towns in America. (As designated in the book of the same name by John Villani, A John Muir publication). The town features over 15 galleries representing the work of more than 200 artists. Idyllwild is filled with unique gift and antique shops, boutiques, galleries, and wide variety of dining options. There are hundreds of miles of hiking and mountain biking trails for all levels from gentle strolls to strenuous trails leading to the meadows and peaks that tower above the village. Fishing is also available within 20 minutes at Lake Fulmor and Lake Hemet.